Former Trump campaign chairman Paul Manafort has been in ongoing negotiations with special counsel Robert Mueller’s office over a potential plea agreement, sources familiar with the negotiations tell ABC News. The discussions, which have picked up steam in the last several weeks, come ahead of Manafort’s second trial, which is slated to begin later this month in federal court in Washington, D.C.
Sources tell ABC News that Mueller’s office is seeking cooperation from Manafort for information related to President Donald Trump and the 2016 campaign. Manafort, however, is resisting and his team is pushing prosecutors for a plea agreement that does not include cooperation, at least as related to the president, sources said. A spokesperson for Manafort declined to comment. A representative from the special counsel's office also declined to comment. Paul Manafort, President Donald Trump's former campaign chairman, leaves the federal courthouse in Washington, DC, Nov. 6, 2017. It was just under a year ago that Manafort’s troubles with the special counsel began when he was charged in Washington, D.C., with several counts of fraud and failing to register as a foreign agent. 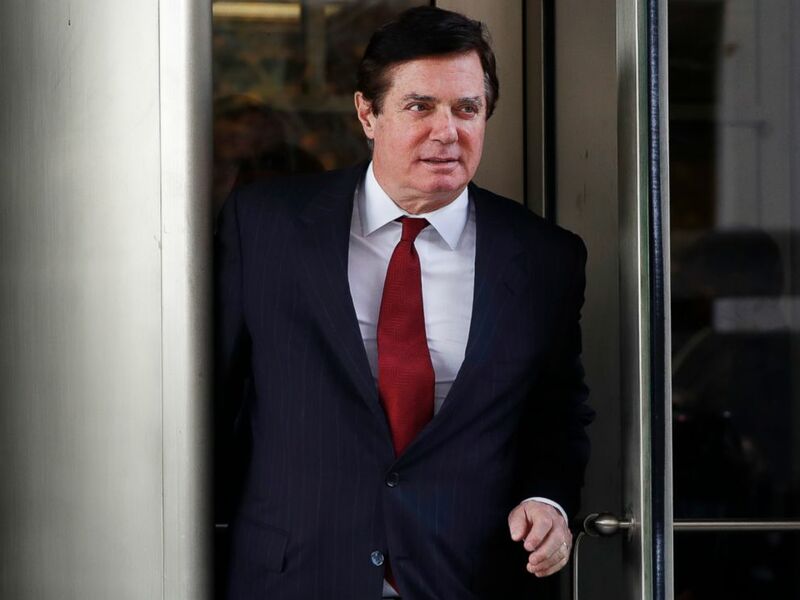 A second case was opened in Virginia earlier this year on related charges that ended with a jury finding Manafort guilty on eight counts out of an 18-count indictment. Manafort has been held in jail for the last several months after prosecutors accused him of witness tampering. The 69-year-old veteran GOP operative joined the president’s campaign in March 2016, tasked with wrangling delegates ahead of the Republican National Convention. He was elevated to campaign chairman in May 2016, taking command of the president’s campaign just before he captured the GOP nomination. Manafort left the Trump campaign in August 2016. Manafort departed the campaign in August days after the New York Times and the Associated Press ran reports that he had been tied to alleged undisclosed foreign lobbying practices in Ukraine. Earlier Wednesday, prosecutors filed a brief providing further insight into what sort of evidence they plan to offer against Manafort if the upcoming trial proceeds. The brief came in response to the defense’s efforts to exclude at least one thousand proposed government exhibits. Prosecutors argued in their brief that photos, invoices and email records they want to introduce show evidence of Manafort using illegal financial practices to fund his lifestyle. Photos of Manafort's homes and lavish goods would be pieces of evidence that "make clear that the expenditures were for personal purposes." The prosecutor's brief was in response to a filing by the defense on Sept. 4 which opposed the introduction of many pieces of evidence on the grounds of relevance and hearsay. Telephone records and emails showing communications between Manafort and other individuals in the indictment were also included in the brief as "direct evidence of Manafort's obstruction of justice." According to statements by the judge in Manafort's DC trial last week, exhibits would have been the topic of a pre-trial hearing that was set to take place Wednesday morning. That hearing was rescheduled for Friday. No explanation was offered for why the date of the hearing may have been moved.